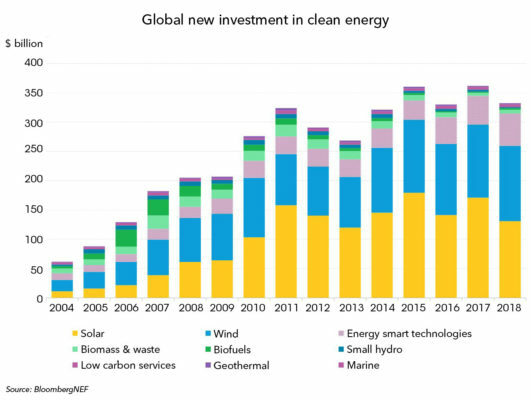 Bloomberg (BNEF) reported today a first estimate on global investment in clean energy in 2018. It dropped 8 per cent to $332.1bn. In geographical terms, the downturn was mainly due to China where investment was down 32% to $100.1 billion. That was still enough to keep the top spot, followed by the U.S. (+12%), Japan (-16%), India (-21%) and Germany (-32% to $10.5bn). The authors expect another reduction of both costs and overall investment in 2019. This would be bad news for #wind turbine and #PV cell/module makers. The really disappointing news, however, is the stagnation of clean energy investment for nine years in a row, as the chart shows. Since the year 2010, investment has been more or less stagnating. In stark contrast to media headlines and alarming climate phenomena, clean energy apparently has not become more attractive for the investment community. This is all the more true when we subtract China´s investment share. In a broader perspective, this casts more doubt on a market-oriented, liberal approach of energy transition, promoted by BNEF (Liebreich) and many other experts.